What is it that makes the Starbucks brand so distinct? It isn’t their logo, although the siren mark is definitely different from any other coffee chain out there. It isn’t their fonts, because Helvetica is hands-down the most popular brand font among large brands. And it definitely isn’t their products; you can find a caramel mocha and even a pumpkin spice latte just about anywhere these days. The thing that makes a great brand like Starbucks so distinct is that they’ve considered the entire experience a customer has with them and they’ve branded every single interaction. The key to creating a one-of-a-kind brand is covering all of your bases, from the names you give your products and services to the colors you choose to use on your website. You can’t just create a logo, choose three brand colors, and call it a day. If you want your brand to be professional, memorable, and effective, you have to use intention and fill in all the gaps. But this is a tall order, isn’t it? Where do you even start? How do create an entire experience that attracts potential clients and customers? 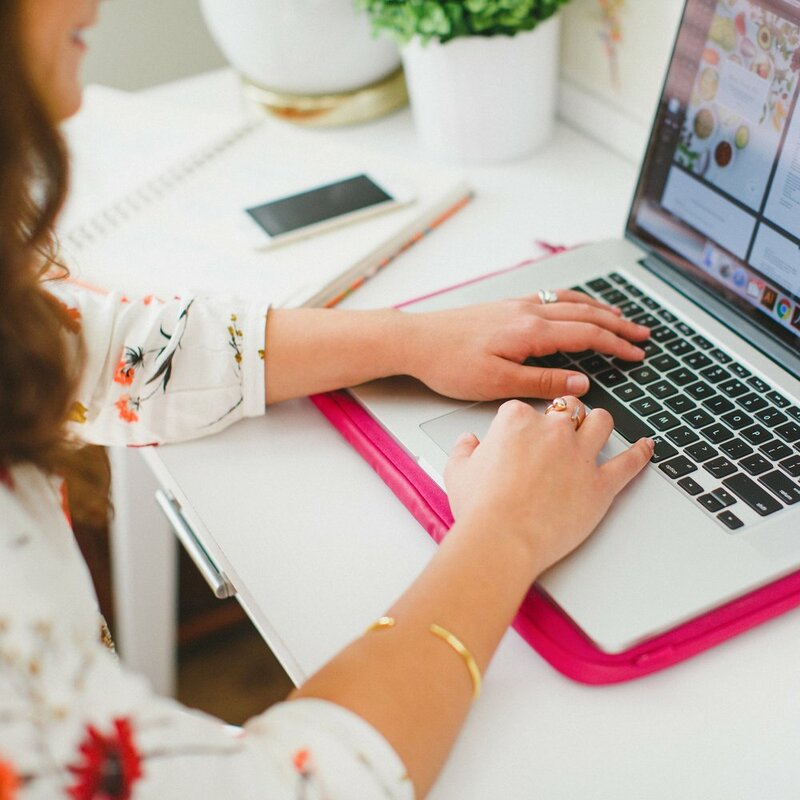 Because over the next month, I’ll be guiding you through the exact steps you need to take to create a one-of-a-kind brand from start to finish through Elle & Company’s February Brand Challenge. Each Monday for the month of February (with the exception of today’s post), I’ll share a new blog post with five practical action steps for building your brand. They’re small enough that you can tackle one each weekday, or you can save time on the weekend and knock them out all in one sitting. I’ll provide all the details and resources you need to complete these weekly action steps, along with a free workbook. You can share your progress and join in the new Elle & Company Community Facebook Group throughout the challenge and use the hashtag #ellecobrandchallenge on social media (because a little accountability and support can go a long way). By the end of the month, you’ll be fully equipped to create a one-of-a-kind experience for potential clients and customers through your brand. Are you up for the challenge? I’m one of millions of Americans who loves watching the show Fixer Upper. It’s incredible to see how Chip and Joanna can take a house in terrible condition and transform it into a beautiful home with personal touches that suit the new owners perfectly. And while the reveal at the end of the show is always my favorite, the final transformation of the fixer upper wouldn’t be quite as amazing if I hadn’t taken the time to watch the story unfold from start to finish. The before and after pictures wouldn’t quite do it justice. Because Chip and Joanna don’t just find any old home, pretty it up, and call it a day. Instead, they get to know their clients, understand the needs of the family and the features they need in a home, and transform a house into a perfect fit. It always ends in a meaningful reveal that brings their clients to tears because of all the thoughtful, personal touches. That should be how you approach your “fixer upper” of a brand. Instead of jumping right into colors and fonts and graphics, you have to lay the groundwork and set objectives for what you’re trying to achieve. I have five action steps for you this week that will set the foundation for the remainder of the challenge. I’ll show you exactly how to use the information from this section throughout the next few weeks, so be sure to work through each and every step. Trust me, I’m not a fan of busy work - it all has a purpose. Subscribe with your name and email address to access to the in-depth workbook for Week 1 of this month's Brand Challenge. You wouldn’t renovate a house without inspecting it first and evaluating the work that needs to be done. The same goes for your brand. For those of you who have an existing business, it’s important to take some time and evaluate your brand to pinpoint what you’ve been doing right and what needs to be improved upon. You may not need a huge overhaul, and you may not uncover some underlying problems with your brand until we dive further into this challenge over the next few weeks. You can find all of these questions in your workbook on pages 3 and 4. You can find all of these questions in your workbook on page 4, and I left space for you to fill in the responses from all three interviews. Remember, the goal of this evaluation is to reveal areas that need to be improved. Don’t take any of the feedback personally; instead, look at it as a learning opportunity and let any weak spots drive you to make improvements throughout these next few weeks. But I always tell my design clients that the goal isn’t to brand their business for the here and now; we’re branding their business to get them where they want to be 5 years from now. 1 | Don’t switch your brand up every year or two. It’s important to maintain consistency with your brand so people begin to recognize it, remember it, and form a connection with it. 2 | You need to know what your goals are in order to create a brand that helps you reach them. So go ahead and write down your 1-year business goals and 5-year business goals on page 7 of your workbook. How much money do you hope to make? Yes, your business might change directions or new opportunities might present themselves a year from now. But it’s important to have these goals in mind as you approach your brand because they might affect the decisions you make in the weeks to come. That message is often summed up best by a mission statement. A mission statement is a one-sentence summary of your business that tells others what you do, who you help, and how you help them. Do you have to stay inside this framework? Of course not! You’re a creative entrepreneur, so take the liberty to get creative with it and make it your own. But remember that making it as specific and actionable as possible will help you as you strive to communicate this message through your brand. Take some time to brainstorm and write your mission statement on page 8 of your workbook. If you’re having a hard time narrowing it down and finding the right words, don’t get frustrated! Sometimes you need a few days to sit on it. These types of things always fall into place for me at random times (on the interstate, in a meeting, at the post office), and I’d like to think that’s normal. A navy and blush color palette and delicate feminine details swirled around in my head as she explained her target audience. But the conversation took a drastic turn when my client told me that she wanted to use her favorite colors - purple and teal - for her brand. Unfortunately, this is a common mistake that I see a lot of business owners make as they approach their brand. I’ve included a profile outline on pages 9 and 10 of this week’s workbook. You’ll refer back to this outline as you make decisions about font, colors, and iconography in the weeks to come. This is my favorite part of the “groundwork” process. Now that you’ve written your mission statement and outlined your ideal client/customer profile, choose 10 adjectives that best describe your brand. I left plenty of space for you to brainstorm adjectives on page 10 and list your top 10 on page 11 of this week’s workbook. These 10 words will come in handy as you build your inspiration board and make other brand decisions in the weeks to come. I left space for you to brainstorm and fill in your answers on page 11 of your workbook, too. I can’t stress the importance of these groundwork steps enough. The hard work you do this week will pay dividends as you continue to build and refine your brand throughout the remainder of this month. Which of these 5 steps are you most excited to work on? After you work through them, share your mission statement and 10 adjectives with me below!